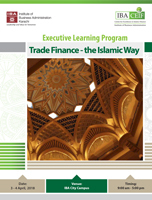 IBA Centre for Excellence in Islamic Finance (IBA-CEIF) is offering a two-day course on trade finance mechanisms in Islamic Banks. The course has been designed to apprise the participants with the various trade finance modes being used in banks in accordance with Shariah Law. The participants will be able to differentiate between the conventional and Islamic ways of facilitating trade and will be exposed to dynamic new concepts being discussed in a fast changing world.